Shannon Connor Winward is the author of the Elgin-award winning chapbook, Undoing Winter. Her writing has earned recognition in the Writers of the Future Contest and the Delaware Division of the Art Individual Artist Fellowship in literature. Her work has appeared in (or is forthcoming from) Fantasy & Science Fiction, Analog, The Pedestal Magazine, Literary Mama, Strange Horizons, PANK, and The Monarch Review, among others. In between writing, parenting, and other madness, Shannon is also an officer for the Science Fiction Poetry Association, poetry editor for Devilfish Review, and founding editor of Riddled with Arrows Literary Journal. Visit Shannon on the web at shannonconnorwinward.com. 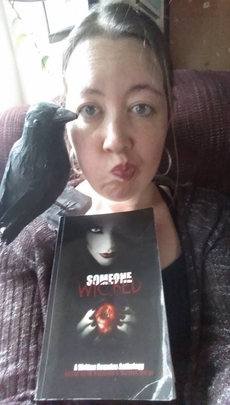 Shannon's story, "The Devil Inside," was published in Someone Wicked: A Written Remains Anthology. Her story, "To Heart's Content," appeared in A Plague of Shadows: A Written Remains Anthology.